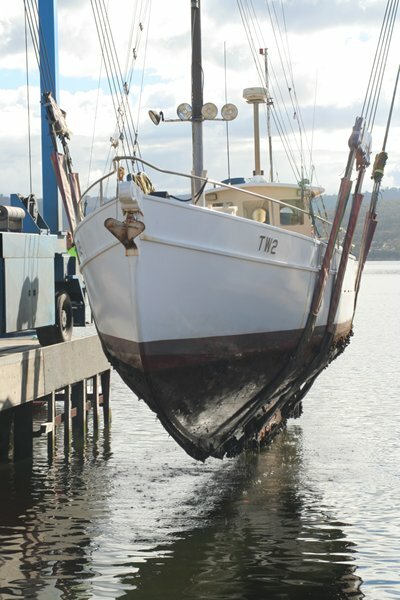 Annemarie was launched in 1936 in Cygnet, Huon Valley, Tasmania. 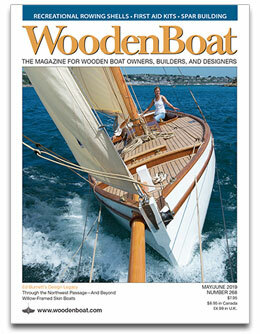 She was built by the Wilson Brothers of Cygnet in the Huon Valley. 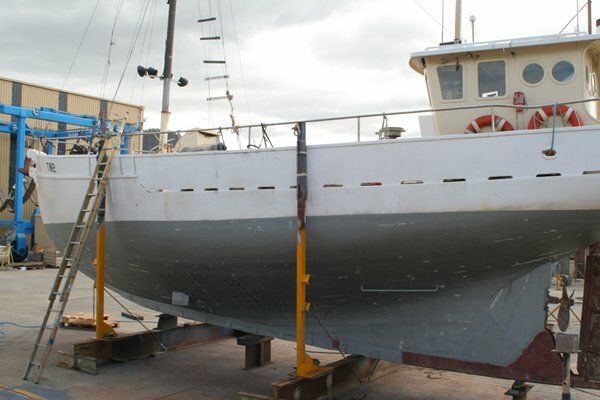 The dimensions are as follows: 45 feet on the cap, 13 feet beam, around 7 feet draught (at the moment it’s 6′10″ displacement is around 23 ton, after removing the wheelhouse and all the electronic used for commercial fishing , the stern lifted 6″! She was built for Captain T Spaulding (who had a fleet of trading ketches and schooners ) for deep sea fishing. She was originally a gaff ketch. I talked with an old fisherman , he’s in his mid eighties now, this past weekend. He told me how he remembered her back in 1947 as a gaff ketch fishing out of Stanley in the Bass Strait, for shark. He knows a lot about her and I have asked him to sit down with me and tell everything he knows . What amazes me is this, where ever I go I meet people who have had encounters with her or has worked on her during her 69 years of commercial fishing before I bought her. 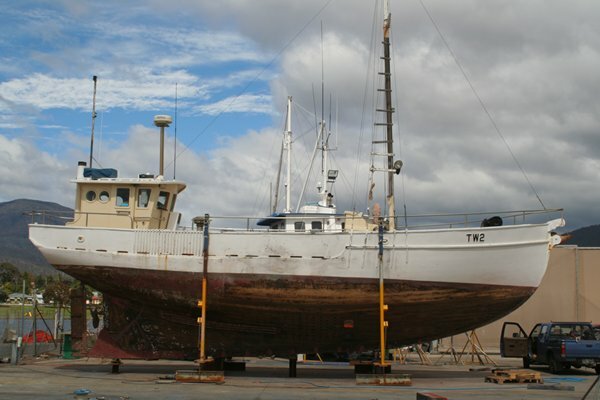 One story told to me was about a trip to King Island , Karl Schramm was the owner, fishing out of Stanley, well the weather picked up, as it does in Bass Strait, and the deck hand thought it was going to be his last trip, ever! So not only did he have the life jacket on, he had managed to get himself inserted in the life ring as well! 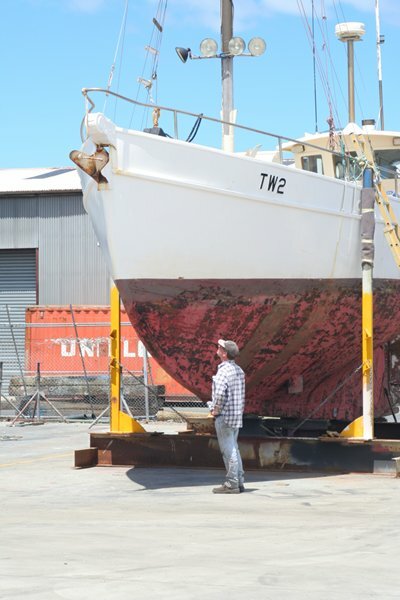 Well they made it, but the skipper who told me this story said “you have one of the most seaworthy boats here in Tas.” The Wilson family of Cygnet are renowned for having built some of the fastest trading ketches, schooners and fishing boats in Tasmania. Annemarie, then Gladys S. won the fishing boat race in her first year. As one abalone fisherman said to me about the propeller, when our boats were parked side by side on the hardstand “That’s just an ‘eggbeater’ but with a hull like that , what more do you need ?!?! 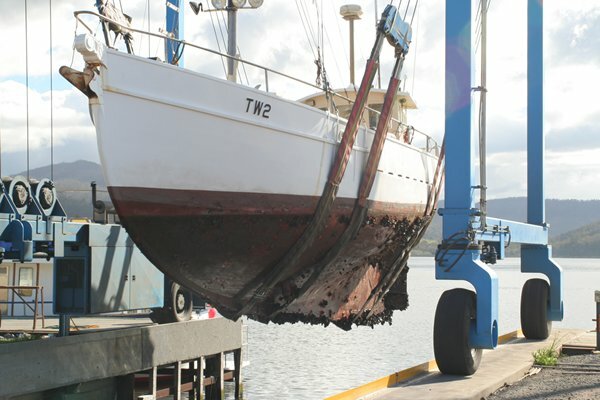 ?” She is still officially a commercial vessel , with her papers “sitting on the shelf ” for the time being , while we get her sorted out, not bad for a 75 year old boat, try that with a metal boat! Well , I could go on for the next fifty pages… hehe.